The Village of Westmont has created a unique display honoring two Blues Hall of Fame legends - Eddy Clearwater and Muddy Waters. The exhibit is now on display at Village Hall, 31 W. Quincy Street, 2nd floor. There are more than 20 items on display including a signed guitar by Clearwater, hand-written song lyrics, and Muddy Waters’ first Grammy award. The display is open to the public Monday through Friday, 8:00 a.m. to 4:00 p.m. The display will continue through the end of July. In the early 1970's, Muddy Waters, considered to be the Godfather of the Blues, moved from the south side of Chicago to Westmont. With several young children who he had taken under his wing, he felt that he needed to move into a better environment for his family. His manager Scott Cameron found a location in Westmont and Muddy fell in love with the community immediately. Wherever Waters toured throughout the world, he was proud to say he was from Westmont. One of the items on exhibit is his personal business card, which lists his address as Westmont, Illinois. Eddy “The Chief” Clearwater, who had befriended Waters years previously, moved to Westmont in the early 1980’s and lived in town for about a decade. Clearwater, 81, who now lives in Skokie, came to visit his former town on April 27, 2016 to donate a variety of items for our blues historical exhibit. Clearwater was inducted into the Blues Hall of Fame this past May. 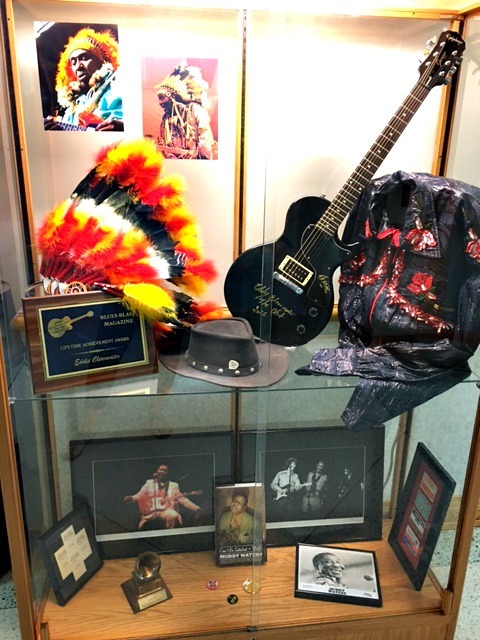 The entire blues history exhibit can be viewed at the Westmont Special Events Corporation office in the Wesmont Centre building at 1 South Cass Avenue.